The words from the LORD that struck a chord deep in Samuel Sudhakar’s heart and irreversibly changed his life was from Revelation 2:4, “Nevertheless have somewhat against thee, because thou has left thy first love.” Falling on his bended knees he prayed “The cross before me and the world behind me. Let thy perfect will be done in my life. Thy will is my pleasure LORD.” Describing one of the most vital and crucial moments of his call, he says, “God’s love penetrated deep inside my heart and I had no option except to submit humbly at his feet. Amazing grace, how sweet a sound, that saved a wretch like me. I once was lost, but now am found, was blind, but now I see.” Continuing about his transformation he further adds, “If at all I am alive now, preaching the word of God and standing before you, it is only because of God’s grace. The life that I live now does not belong to me but to Jesus Christ the Savior who saved me from the miry clay of sin and from the clutches of Satan.” The LORD Jesus Christ is undoubtedly the core that lies at the centre of Samuel Sudhakar’s life and being. Born into a middle class family on 9th may 1960, Samuel Sudhakar led a very eventful and happy childhood. When one looks back it appears as though Christ had marked him out as unique and special. Two instances of God’s grace and protection stand out. The first was when the little Samuel and his sister were suffering from dengue fever. The two year old Samuel was mercifully saved from death but his young sister succumbed. In Standard one when he lost his way home, an angel of the LORD took the form of an unknown person and escorted the little boy home and restored him to his grieving parents. He became a Sunday school teacher and also a youth leader in his church at Triplicane, Chennai, South India. He won many laurels for his church when he participated in Bible quizzes and singing competitions. In 1979, as a student in the first year at the prestigious Madras Christian College, Tambaram, he became one of the leaders of a newly founded prayer cell. This prayer group met regularly all the three years of his undergraduate life at college. However, soon after he graduated from Madras Christian College, he knew that he had been chosen by God for a special Purpose – to assist Rev. Dr. John Joseph in undertaking ministry work. His parents gladly gave their son to the LORD; just as in the Old Testament Hannah had offered her son Samuel to serve in the temple of God. Samuel Sudhakar left his parents and his home with only a set of clothes to follow his mentor and guide, Rev. Dr. John Joseph who had started a new ministry named “Christ For Every Soul”, inspired by the verse “Behold, all souls are mine” (Ezekiel 18:4). “Christ For Every Soul” is a faith ministry depending solely on God for its existence. This vocation meant that he would no longer live like other young men, enjoying the company of friends and family. God’s call to him meant that he had to give up everything for the LORD. In an early sermon Samuel Sudhakar said, “My very close friend who was everything to me became nothing when God’s call came and His anointing engulfed me.” As one follows the trajectory of his life thereafter, it becomes evident that he stands as a towering witness for the awesome power, love, grace and mercy of the LORD. During the period 1982 to 2007, Rev. 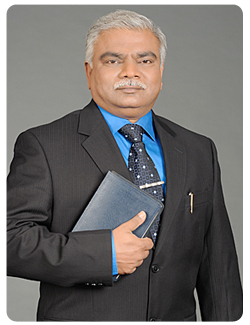 Dr. John Joseph trained Samuel Sudhakar in the conduction and operation of several spheres of the ministry. He held the finance portfolio of the ministry. He also assisted Dr. John Joseph in editing the ministry’s monthly magazine, “The Voice of Restoration.” Apart from this, Samuel Sudhakar worked as a secretary to Rev. Dr. John Joseph, keeping track of the preaching schedule, personal appointments and correspondence. From 1988, Dr. John Joseph gave his young assistant the responsibility of conducting the prayer meetings that were held every Friday and when Rev. Dr. John Joseph travelled abroad for other meetings, the regular Tuesday meetings were to be led by Samuel Sudhakar. Today Rev. Dr. Samuel Sudhakar excels in ministry work. He holds doctorates in Evangelism, Divinity and Ministry. By God’s immense grace and mercy he finished his M.B.A. degree in Human Resources with a high first class on May 2010. He has dedicated all these degrees at the feet of God and says in the words of Paul the Apostle, “.. and I count all things but loss for the excellency of the knowledge of Christ Jesus my LORD … and do count them but dung, that I may win Christ, And be found in him, not having mine own righteousness, which is of the law, but that which is through the faith of Christ, the righteousness which is of God by faith…” Phil 3:8-9. Dr. John Joseph had left behind a rich legacy and Rev. Dr.SamuelSudhakar was indeed a worthy inheritor. He possessed the anointing grace and power of the Holy Spirit, the gift of preaching the Word of God with fervent zeal and the prophetic vision of Rev. Dr. John Joseph, his mentor, right from the very start. The prophecies made by Dr. Samuel Sudhakar on the first of January 2008 and the revelations that the LORD revealed through him were fulfilled by the end of the year. extensive spiritual training and the rich experience gained under the guidance and leadership of Rev. Dr. John Joseph have enabled Dr. Samuel Sudhakar to adopt various aspects of ministry work especially the literature ministry. In the year 2007, beginning of October, as led by the Spirit of God he published a daily devotional reading “My Daily Strength” published both in English and in the regional language, Tamil which was intended to publish every month. But as the Word of God says, “For my thoughts are not your thoughts..” Isa 55:8, the LORD led him to release an Annual Edition for the year 2008. And the blessing of God continues and shall continue as it is HIS will. The publication for the year 2012 will be the fifth in a series of consecutive publishing and it will be published in five languages (English, Tamil, Hindi, Telugu, Malayalam). Apart from being a trustee of “Christ For Every Soul”, he is the Chaplain of the centuries old Christ Church which is a landmark in the city of Chennai. He is also the Hon. Correspondent of the Christ Church Anglo Indian Higher Secondary School. He is on the Board of Directors of the Madras Y.M.C.A. and is a Chairman of many activities of Y.M.C.A. His expertise has been a blessing to many not only in the state of Tamil Nadu but also in other parts of the world. Dr. Samuel Sudhakar has travelled widely to different parts of the United States of America, Malaysia, Australia, Sri Lanka and Indonesia. The prophetic utterance of Rev. Dr. John Joseph that the “Christ For Every Soul” ministry would take “a new turn” has been fulfilled. It has been realized in the fruitful apostolic and prophetic ministry of Dr. Samuel Sudhakar that has been blessed abundantly by God. Through God’s grace, new ministries like the Friday Bible Study and healing services, the monthly Fasting Prayers and the monthly Night Prayers have brought the message of salvation to countless people, Rev. Dr. Samuel Sudhakar has revived the spiritual T.V. programs in several channels, bringing hope and solace to millions.